My plans for the homestead vineyard haven’t included grapes for white wines. The summer temperatures get pretty high–lot’s of 90-100 degree days. Add in a south facing slope and it’s a recipe for scorched grapes. My understanding (mostly vast ignorance) is that white grapes are better for cooler climes. But maybe plans will change. It doesn’t hurt to experiment as long as there isn’t a big investment involved. In this case, it’s more of a rescue than an investment. I went to Grocery Outlet (everyone hum the theme song!) to stock the small larder of my Sacramento digs. (I’m on a contract about a 14 hour drive from home). A vine caught my eye just before I walked in the door. It was dry looking and starting to shrivel. There weren’t any other vines with it. It’s late July. No-one is going to buy it. I wasn’t going to buy it either. It was probably a seedless something-or-other. Unlike the tag with the purple grapes, Chardonnay produces a green grape, and is used for white wine. Now one vine does not a vineyard make. I’d probably need a minimum of 10 vines to do anything worthwhile. This vine gives me something to play with while I’m away from home. Maybe I should get some starts from it. I could try some cloning techniques that I’ve heard about. Either way, I’m excited about the plant that I could redeem from a bargain market dumpster fate. The vine is from Duarte. The website is www.duartefruittrees.com but it seems to be down. It would be nice to know more about the vine. 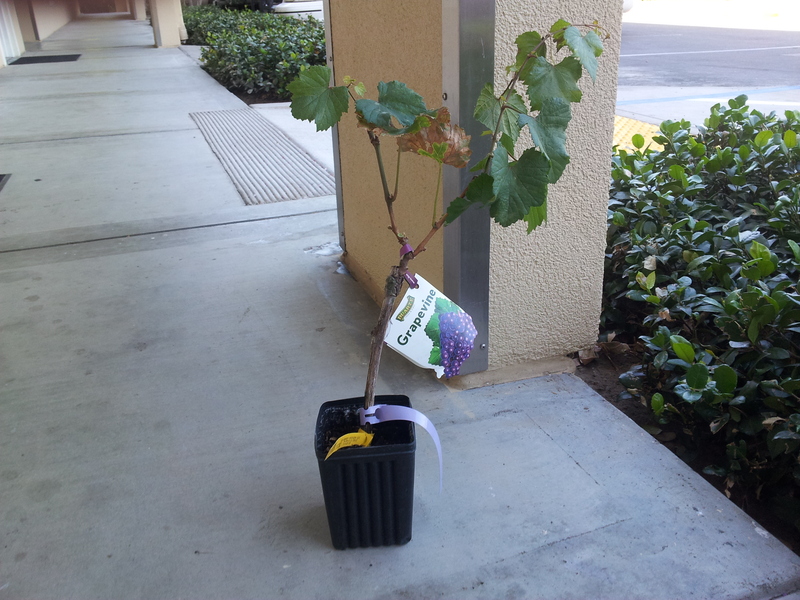 This entry was posted in Plants, Shrubs and Trees and tagged chardonnay, grape, vine by admin. Bookmark the permalink.